Do genes on opposite strands ever overlap? If so, how often? This tutorial is for those who are new to Galaxy, genomics, and bioinformatics. If you aren’t new to bioinformatics you can just do the items listed in the Hands-On boxes (hands_on), or you can try one of the other introductory tutorials. This tutorial teaches the same basic content as Galaxy 101, but requires less knowledge of biology to understand the questions this tutorial addresses. We’ve got the data - what’s our plan for answering the question? Why not use Excel for this? An internet-connected computer. 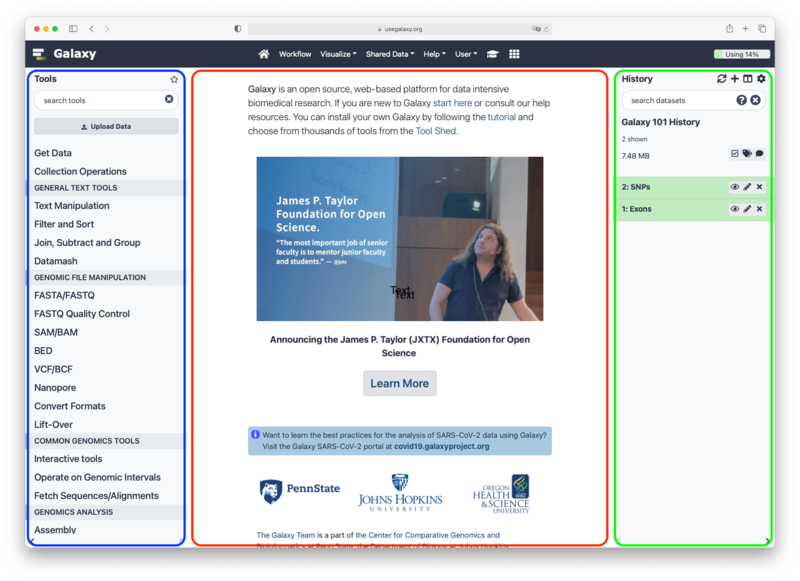 Galaxy can run on your laptop without an internet connection, but this practical requires access to resources on the web. A web browser. Firefox and Google Chrome work well, as does Safari. Internet Explorer is known to have issues with Galaxy so avoid using that. Access to a Galaxy instance. Galaxy is available in many ways. If you are doing this practical as part of a workshop, the instructor will tell you which instance to use. If you are doing this on your own, you can use usegalaxy.org. I wonder if genes on opposite strands ever overlap with each other, and if so, how common is that? To explore this question we need a basic understanding of genomes, chromosomes, strands, and genes. The genome is the collection of all DNA native to an organism. For humans, the genome is all of a person’s chromosomes. Chromosomes are double-stranded. One is the forward strand, is typically drawn on top, and moves from left to right. The other, reverse strand, is typically drawn on the bottom and moves from right to left. 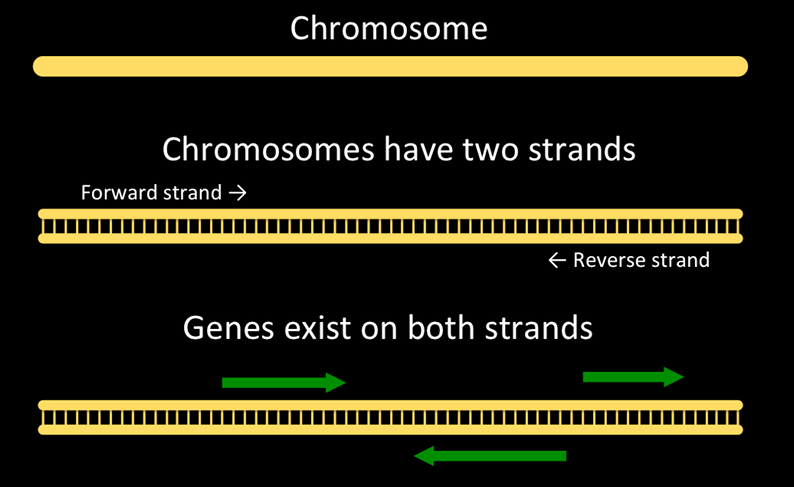 Genes can occur on either strand. A single gene will have parts on only one stand. “What is a gene?” is actually a hotly debated question. For our purposes, a gene is a section of DNA on chromosome strand that creates a molecule used by an organism. And here’s a representation of a chromosome, strands, and genes on the chromosome. Non-overlapping genes are common. How common are overlapping genes? To answer this question we need to know where genes start and stop on human chromosomes. That seems like a simple question, but if you are new to bioinformatics it’s actually a hard question to answer. Web searches will land you at any number of useful places on the web, but without a lot of background knowledge it’s hard to know what you want: What’s the difference between sequence and annotation? What are FASTA, BED, GTF, GFF3, and VCF? What are GRCh37, GRCh38, hg19, and hg38 (and what happened to hg20 through hg37 - are they okay)? It turns out that for this particular question (and for many others), most Galaxy instances can help us find this information. In your web browser, go to your Galaxy instance and log in or register. The Galaxy interface consists of three main parts. The available tools are listed on the left, your analysis history is recorded on the right, and the central panel will show the home page, tool forms, and dataset content. If this is the first time you have used this Galaxy server, then your history panel will look like the image above. There are many ways to get data into a Galaxy instance. We are going to use the Get Data toolbox in the Tools panel on the left. Click on the Get Data toolbox to expand it. The Get Data toolbox contains a list of data sources that this Galaxy instance can get data directly from. Upload file is quite useful for getting data from your computer or from the web (see the Getting data into Galaxy slides). Today we are going to use the UCSC Main table browser. Click on the tool UCSC Main table browser to go to UCSC. 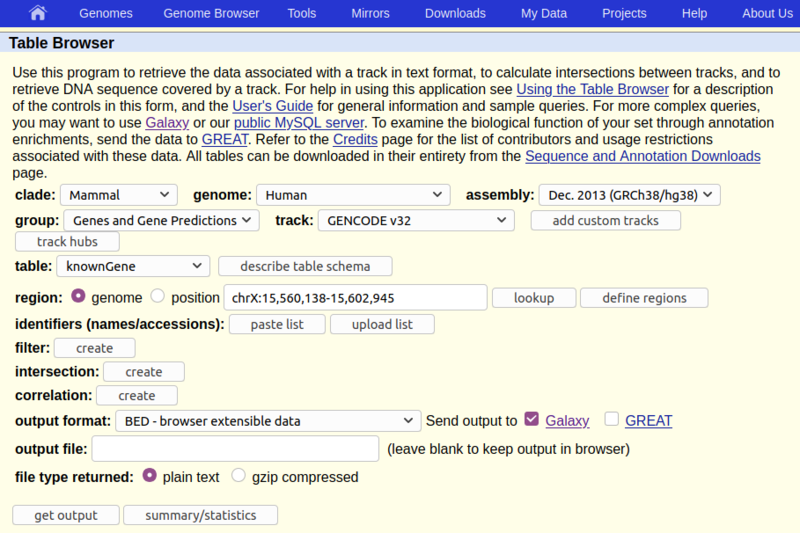 The UCSC Table Browser provides access to all the data that is shown in the UCSC Genome Browser (see box below). If you are working on a species that UCSC supports (like human) then the Table Browser is a great place to get genomic data. clade and genome seem pretty clear. assembly asks which version/definition of the human genome we want. (Any will do for our question, but UCSC is suggesting hg38, which is also the most recent.) group is set to Genes and Gene Predictions which sounds like what we want. So far so good. Time for a few more definitions. A reference genome is the genome of a single individual that has been thoroughly studied, to the point that we know exactly what most of that individual’s DNA is. In practice a reference genome is used as shared map by researchers working on that organism. Reference genomes are updated periodically as techniques improve. The sequence tells us what DNA is where, but it doesn’t tell us anything about the function of that DNA. Annotation is additional information about particular regions of the genome like where genes, repeats, promotors, and centromeres are, or how active a particular gene is. GENCODE is “high-quality” and “gene annotation.” That sounds like a good thing to use. Lets stay with the default: GENCODE V24. So far we haven’t changed anything from the defaults. Lets change something. The default region is the whole genome, which can be done, but it’s a lot of information. For this exercise lets use just one (small) chromosome. hands_on Hands-on: Limit the region and get the data. In the text box next to position enter chr22 (case matters). And, that doesn’t actually get us the output. It sends us to a second UCSC page that asks us exactly what we want. Under Create one BED record per make sure that Whole Gene is selected. Click the Send query to Galaxy button at the bottom of the form. This returns us to Galaxy, first displaying a big green box (that’s good!) and then returning us to the view we started with. Except that we now have an item in our history, the dataset from UCSC. Watch your new history item. It will go through three statuses before it’s done. Yellow Spinner Item is running (data is actively being transferred). Green None Item has finished successfully (data transfer complete). Red: Item did not finish successfully. hands_on Hands-on: Look at the data. This expands the dataset and shows you information about it, and a preview of its contents. The dataset has over 4000 regions, meaning that there are over 4000 genes on chromosome 22. The dataset is in bed format. BED is one of several standard formats for representing genome annotation. BED is a tabular format that we’ll expand on below. We got BED format because BED was preselected as the output format in the UCSC table browser. The dataset’s “database” is hg38. This says which revision of the reference genome this data maps too. hg38 is the latest human reference genome. hg38 was also selected by default in UCSC. Finally, it shows us the first 5 rows in the dataset. hands_on Hands-on: Look at all the data. Click on the galaxy-eye (eye) icon to view the contents of the dataset. BED is one of several well-established tabular formats for genomic data. Other formats include GFF3 and GTF. For the type of analysis we are doing today, BED format is easiest to work with. BED was created to power the UCSC Genome Browser. BED files contain between 3 and 15 columns. Our example BED file describes genes and contains 12 columns. 1 Chromosome The name of the chromosome this gene is on. 2 Start Where on the chromosome the gene starts. 3 End Where on the chromosome the gene ends. See the BED format description at UCSC for a full description of all the columns. Name your input and final output datasets, and any significant intermediate datasets. You don’t have to do this. Galaxy is quite happy for you to have an infinite number of “Unnamed history” histories, and to have all your datasets be obscurely named. However, once you’ve run your first 5 unnamed analyses, all with obscurely named datasets, you’ll might wish you would have named everything. Name your history to be meaningful and easy to find. Click on the title of the history and enter something like Intro - Strands as the name. Hit the enter key on your keyboard to save it. Click on the pencil icon to edit the dataset attributes. In the next screen change the name of the dataset to something like Genes or Genes chr22. You have to know what’s possible, before you can build a plan. If you don’t have experience with data analysis then you might not have any idea how you would answer our question. Before we dive in using a particular solution, think about how you might solve this. If you don’t have any experience with tools, then think about how you might solve it manually, using pencil and paper (it may help to assume you have an infinite supply of helpers to do the pencil and paper work). Here’s how we’ll answer this question. Split the genes dataset in two: one for genes on the forward strand, and one for genes on the reverse strand. Compare the two datasets to see which ones, if any, overlap. Check how many (or what percentage) of our genes overlap with another gene. It turns out that all of these steps are easy in Galaxy. How might we do this? Column 6 contains the strand information. Can we split genes into two datasets based on the value of Column 6. How? Lets take a look at our available tools. And whoa! There are over 40 toolboxes, and several hundred tools. How are we going to find a tool that can do the split? Try the tools search box. Think of terms that might describe what we want to do and type them in the search box. Do you see anything promising? Explore a little. Filter data on any column using simple expressions. Click on Filter to open the Filter tool in the central panel. Take a look at the Syntax and Example sections to understand what the tool does. It doesn’t say anything about Filter being able to split a file into multiple files. It does look like we can use Filter to get only genes on the forward strand, or only genes on the reverse strand. We would have to run Filter twice, once for forward strand genes, and once for reverse strand genes. Let’s do that. hands_on Hands-on: Run the Filter tool to get genes on the forward strand. Dataset: This pulldown will list any dataset from your history that this tool can work on. In your case that’s probably only one dataset. Make sure this is set to your Genes dataset. Condition: this free text field is where we specify which records we want in the output dataset. Enter c6 == "+" in the text box. This specifies that column 6 (the strand) must be equal to (== is Python for is equal to) a plus sign. Header lines to skip: Leave this as 0. Our dataset does not have any header lines. Finally, click the Execute button. This adds another dataset to your history. This one should contain only genes on the forward strand. Once the dataset is green, click the galaxy-eye (eye) icon to confirm this. We also recommend that you rename this dataset to something like Genes, forward strand (remember how?). Now we want to get the genes on the reverse strand. There are actually many ways to get this. Here are two of them. Open the dataset preview by clicking on the name of the Genes, forward strand dataset. This shows an icon than the uploaded Genes dataset did not: a looping arrow. Click the looping arrow (“Run this job again”) icon. This won’t actually run the job again. What it will do is bring up the Filter tool form with the exact same settings that were used to produce this dataset. Rather than run Filter again with the same settings, change Condition to c6 == "-"
Click on Filter in the tool panel to open the Filter tool in the central panel. Make sure the Dataset pulldown is set to the Genes dataset. Set Condition to c6 == "-". The rerun button can be a huge help as you run more complex tools. If you used Method 2 and didn’t explicitly set the dataset, then you ran Filter on the Genes, forward strand dataset. None of the genes in the forward strand dataset have “-“ in column 6 so all of them were filtered out from the result. Try again and set the dataset to your Genes dataset. The number of genes in the forward plus reverse datasets should be the same as in the Genes dataset. If they aren’t can you figure out why? Genes are an example of a genomic interval. In Galaxy, a genomic interval is a something that spans part of a chromosome (or some other linear frame of reference like a contig). Genes are a common example of a genomic interval. Even a chromosome is a genomic interval, albeit a very long one. Galaxy excels at answering questions about genomic intervals and different sets of genomic intervals relate to each other. Lets take a look. In the tool panel, open the Operate on Genomic Intervals toolbox. It’s typically past the NGS toolboxes. Explore the tools in this toolbox, looking for something that we can use to see which genes on opposite strands overlap. Of the tools in the Operate on Genomic Intervals toolbox, Join and particularly Intersect have the most promise. Let’s try Intersect. In the tool panel, click Intersect in the Operate on Genomic Intervals toolbox. This looks like it might return whole genes, while Overlapping pieces may return only the parts that overlap. We suspect that whole genes might be more useful. This will return genes with even just one position overlapping. Now repeat the intersect, but make the first dataset be the reverse genes, and the second be the forward genes. At this point we could say that we have answered our question. Using dataset previews in the history panel, we can compare the number of genes in the Overlapping forward and Overlapping reverse datasets with the number of genes in the full Genes dataset, and conclude that overlapping genes on opposite strands are actually pretty common. Visualize our new dataset, just to double-check our results. Combine forward and reverse overlapping genes into one dataset. What tool can we use to combine the two datasets into one? Try searching for combine or join or stack in the tool search box. You’ll find lots of tools, but none of them do what we want to do. Some times you just have to manually look through toolboxes to find what you need. Where should we look? It’s probably not Get Data or Send Data, but it could easily be in any of the next 4 toolboxes: Lift-Over, Collection Operations, Text Manipulation, or Datamash. Open the Text Manipulation toolbox. Near the top of the toolbox is Concatenate datasets tail-to-head. Click on it. Lets try that tool. Set Concatenate Dataset to Overlapping reverse genes. Click + Insert Dataset. This adds a second dataset pull-down menu to the form. Select Overlapping forward genes as the second dataset. Once the concatenate operation is finished, preview the dataset in your history panel. Does it have the expected number of genes in it? If not, see if you can figure out what happened. Galaxy knows about several visualization options for lots of different dataset types, including BED. Whenever you preview a dataset in the history panel, Galaxy provides links to these visualizations. For BED files (which is the format we have), options include IGB, IGV, and UCSC main. IGB and IGV are widely used desktop applications and eventually you may want to install one or both of them. For now, let’s visualize the data at UCSC, using the UCSC Genome Browser. Click on your Overlapping genes dataset in your history panel. This will show the dataset preview in the history panel. Click on the display at UCSC main link. 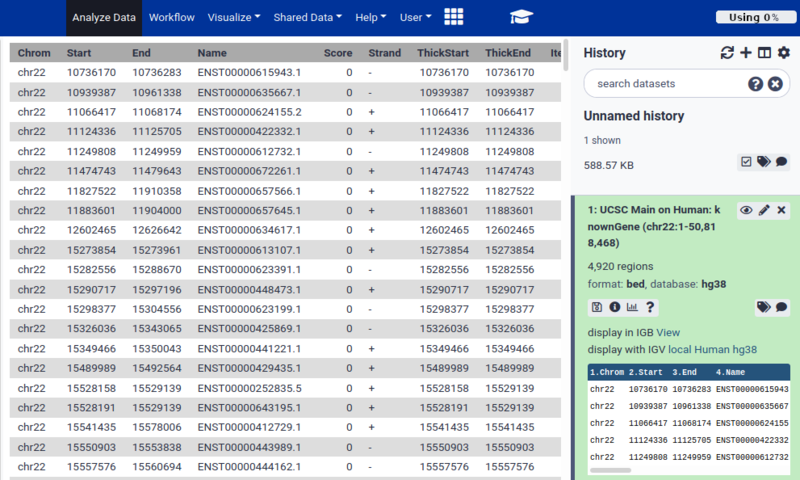 This will launch a new window, showing UCSC’s Genome Browser with our dataset shown right at the top. UCSC figures out that our first overlapping gene is ~11 million bases into chromosome 22, and it has landed us there. Genome browsers are software for viewing genomic information graphically. 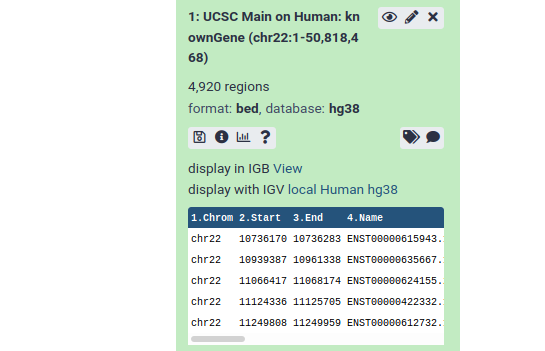 The UCSC Genome Browser (and most genome browsers) typically display different types of annotation about a region of a genome. This is displayed as a stack of tracks and each track contains a different type of information. The UCSC Genome Browser has information on over 100 animals, and their Archaeal Genome Browser has genomic information on well over 100 microbial species. Now, take a look at one of our results. (Any pair of overlapping genes will do.) Our data is in the second to top track (User Track / User Supplied Track). That track shows a line of small black boxes, sometimes connected with a line. Click on the Scale track (the top track) just to the left of the start of the black boxes. Now drag the mouse across the Scale track to just to the right of the black boxes and let go. A window pops up describing several ways to interact with the browser. Just click the Zoom In button at the bottom. This redraws the window, this time zoomed in to what you highlighted. Continue to zoom in until you have the set of linked black boxes you picked centered on the screen. The black boxes connected by lines represent genes, and each set of connected boxes is a single gene (actually, a single transcript of a gene). Take a close look at the top several tracks. It looks like we preserved the gene definitions just fine. It looks like, sure enough, there are overlapping genes here, and they are on opposite sides. The arrows on the connecting lines tell us which strand the gene is on. Um, what’s up with the boxes and the lines connecting them? In humans (and in all plants and animals) the molecules that are built from genes are often only built from a part of the DNA in the gene. The sections of DNA that can produce the molecules are called exons. As you may have guessed (or already knew): The black boxes are exons. Genes are defined as covering the entire area from the first black box to the last connected black box. Our ad hoc review of identified overlapping genes in the UCSC Genome Browser has (or should have!) confirmed that every gene we said has an overlapping gene on the opposite strand does in fact have that. So, our conclusion appears solid: A significant percentage of genes do overlap with other genes on the opposite strand. But, our conclusion may not be as significant as we had hoped. If only parts of genes, the exons, make stuff in our bodies, then should we have run this analysis on just the exons rather then the entire genes? Probably. I wonder if exons on opposite strands ever overlap with each other, and if so, how common is that? So, I have to do this all over again, but with exons? Well, yes and no. We will have to run the analysis again, this time on exons instead of whole genes. But we won’t have to manually recreate every step of our analysis. Galaxy enables us to create a reusable workflow from the analysis we just did, and then we can rerun the analysis, as one step, anytime we want to, and on any dataset. Run the Create a reusable workflow from a history tutorial for how to do this, and then come back here to run your newly created workflow with the exon data. We want to run the same analysis, but this time only look for overlaps that happen in exons, the parts of genes that produce stuff our body uses. Before we start looking at exons, let’s start a new history, one that contains only the genes file we got from UCSC. We could go back to UCSC and refetch the file, but there is an easier way. Click on the gear icon at the top of the current history. Select the Copy Datasets option from the pull down menu. This launches the copy datasets form. Under Source History:, select the dataset(s) you want to copy to the new history. In our case, we only want the Genes dataset. Under Destination History enter an informative history name in the New history named: box. Click the Copy History Items button to create your new history. 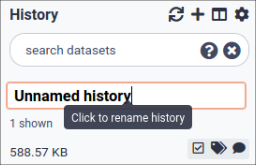 1 dataset copied to 1 history: name you gave your new history. The history name is a link. Click on it. And your new history appears in the history panel with the copied genes dataset. What we need is exons. How can we get the exon information? There are two relatively easy ways to get this information, one of which will be very familiar. The first method involves going back to the UCSC Table Browser. Everything on the first form would stay the same: We still want human, hg38, GENCODE v24, and just chr22. The second form is what changes. Instead of getting the Whole Gene, we need to retrieve the Coding Exons only. Get the exon information, either by revisiting UCSC, or by using the Gene BED To Exon/Intron/Codon BED expander tool. If you use the expander tool select Coding Exons only from the Extract pull-down. Give the resulting dataset a meaningful name. Your history should now have two datasets: one describing entire genes, and one describing just the exons. Rerun the analysis, this time on exons. When you did the History to Workflow tutorial you created a new workflow that was then added to your list of defined workflows. hands_on Run the workflow on the exon data. Click the Workflow tab in the menu at the top of the Galaxy page. This lists all of your defined workflows, including the one you just created. Click on the newly created workflow and select Run from the pull-down menu. 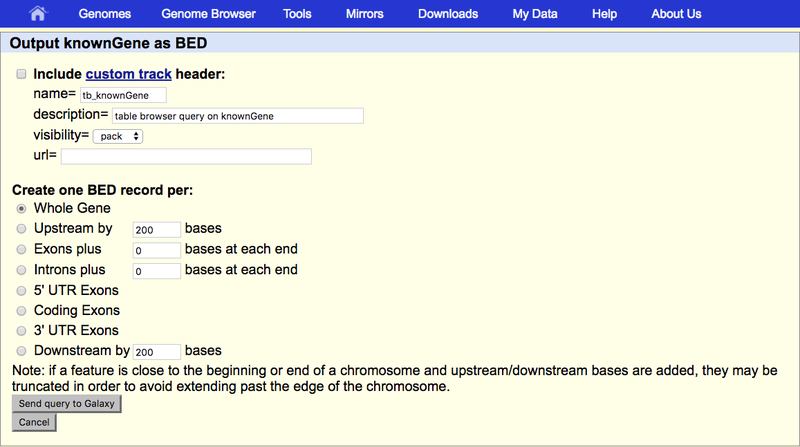 Set the first (and only) input dataset to the Exons dataset, using the pull-down menu. Click the Run workflow button. You can check the status of queued jobs and view the resulting data by refreshing the History pane. Which in this case is the truth. You can refresh the history panel by either reloading the whole page, of by clicking the looping arrow icon at the top of the history panel. What you’ll see is a stack of history steps that will go from queued to running to done as you watch them. All steps in the history will be green when the workflow is done. Once that happens compare your output dataset with your input dataset? What percentage of exons overlap with other exons on the opposite strand, and is it common or rare? Is it a smaller percentage than we saw for whole genes? Probably. Note that we can no longer say what percentage of genes overlap. We can say what percentage of exons overlap, and that is probably close enough for our goals. If it isn’t and we actually need to say what percentage of genes overlap, then we will have to do some extra work. This can be done is several ways, but the Galaxy 101 tutorial may give you some ideas on how to follow this question all the way to genes. trophy Well done! You have just performed your first analysis in Galaxy. You could use Excel or another spreadsheet program to do this analysis. Here, we learned how to use Galaxy by answering a question. You could just as easily learn Excel by answering the same question, and if the goal is to learn how to use a tool, then either tool would be great. But what if you are working on a question where your analysis matters? Maybe you are working with human clinical data trying to diagnose a set of symptoms, or you are working on research that will eventually be published and maybe earn you a Nobel Prize? In these cases your analysis, and the ability to reproduce it exactly, is vitally important, and Excel won’t help you here. It doesn’t track changes and it offers very little insight to others on how you got from your initial data to your conclusions. Galaxy, on the other hand, automatically records every step of your analysis. And when you are done, you can share your analysis with anyone. You can even include a link to it in a paper (or your acceptance speech). In addition, you can create a reusable workflow from your analysis that others (or yourself) can use on other datasets. Another challenge with spreadsheet programs is that they don’t scale to support next generation sequencing (NGS) datasets, a common type of data in genomics, and which often reach gigabytes or even terabytes in size. This material is the result of a collaborative work. Thanks to the Galaxy Training Network and all the contributors ( Dave Clements)!